Communication Models are used to depict any idea, thought or a concept in a more simpler way through diagrams, pictorial representations etc. Models go a long way in making the understanding of any concept easy and clear.This communication for organizations takes place both within the organization as well as with other outside stakeholders outside. The basic flow of communication can be seen in the diagram below. In this flow, the sender sends a message to the receiver and then they share the feedback on the communication process. The methods of communication too need to be carefully considered before you decide on which method to uses for your purposes. Not all communication methods work for all transactions.Once the methods of communication have been understood, the next step would be to consider various communication models. Let’s have a look at some of the famous and frequently used communication models used nowadays. One of the earliest models of communication that introduced was Claude Shannon’s model. This was introduced in 1948. This laid the foundation for the different communication models that we have today, and has greatly helped and enhanced the communication process in various fields. This model can be considered as the granddaddy of many later communication models. Following is a simple illustration of this model. The diagram above clearly illustrates how communication takes place, and also helps one to determine what could go wrong.In Shannon’s model, the information source typically refers to a person, who then sends a message with the use of a transmitter. This transmitter could be any instrument today, from phones to computers and other devices. The signals that are sent and received can be vary depending on the method of communication. Another famous communication model is Berlo’s model. In this model, he stresses on the relationship between the person sending the message and the receiver. 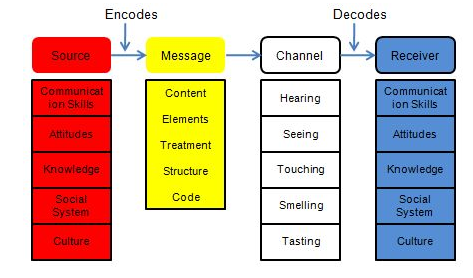 According to this model, for the message to be properly encoded and decoded, the communication skills of both the source and the receiver should be at best. The communication will be at its best only if the two points are skilled. Berlo’s model has four main components and each component has its own sub components describing the assisting factors for each. 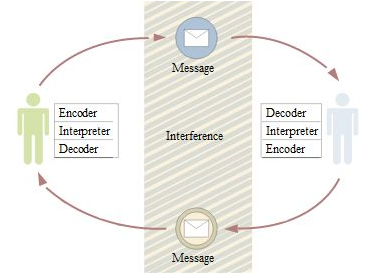 Schramm on the other hand, emphasized in 1954 that both the sender and the receiver take turns playing the role of the encoder and the decoder when it comes to communication.The following diagram illustrates the model proposed by Schramm. These models have been followed by various other models such as the ‘Helical’ model, Aristotle’s models and several other models.You should always keep in mind that each of these models has both their advantages and disadvantages. While some communication models try to break down the whole process in order to make it easier to understand, they are not always as simple as they seem.There are several complexities involved in communications models. This is one thing that needs to be carefully understood in the process of understanding how these models work.